Susan Bowen loves the state of Michigan. Over the years, she's created several memories Up North with her family, so she was excited when the opportunity came up to audition to be a part of a Pure Michigan commercial. She clicked on a link floating around Facebook that took her to a page with information about the casting call on top, and a form to fill out on the bottom. Soon after, a casting company called Nine9 the Unagency reached out and asked her to come into its corporate headquarters in Troy. Susan Bowen loves the state of Michigan. Over the years, she's created several memories Up North with her family, so she was excited when the opportunity came up to audition to be a part of a Pure Michigan commercial. She clicked on a link floating around Facebook that took her to a page with information about the casting call on top, and a form to fill out on the bottom. Soon after, a casting company called Nine9 the Unagency reached out and asked her to come into its corporate headquarters in Troy. After waiting through a presentation and an interview, she says instead of learning about a Pure Michigan opportunity, she got hit with a sales pitch. "You would need to pay $499 down and then $40 a month," Bowen said of the package she would need to sign up for to get employment opportunities. And after all, was said and done, there was no guarantee of a spot with Pure Michigan, nor any other employment opportunity. "I was embarrassed to be there. I was angry, and I felt like a fool," she said. And Bowen wasn’t the only person there who felt misled, she says. Over 30 people in the room were there, she said for the same reason, complaining that they had responded to the same ad. So where’s the disconnect? 7's Taking Action reporter Ameera David got on the case. 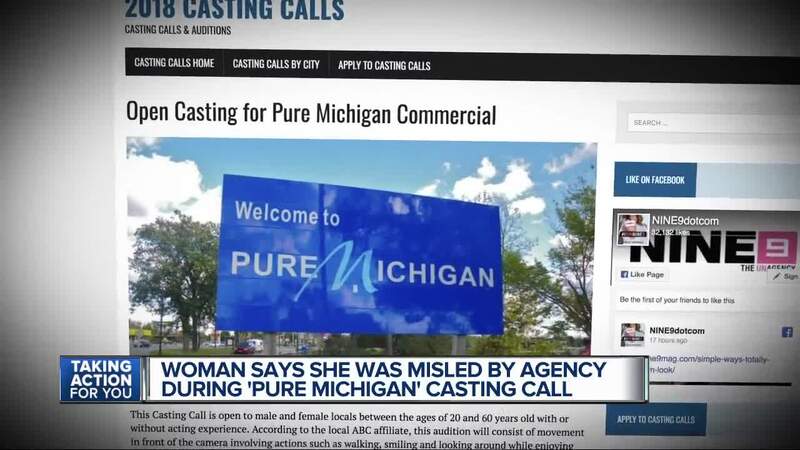 Pure Michigan told 7 Action News that Nine9 is not a company that it does business with. It turns out, it had already flagged Nine9 for circulating online what it called an erroneous and misleading ad. The real casting call had already been carried out by a different agency in the UP at the end of August. Pure Michigan says it immediately requested they stop advertising and that the false ads be taken down, and Nine9 removed the material. When asked about the ad, Nine9 said it was merely a blog post and was not meant to be confused as an advertisement for a Nine9 casting call. We apologize for any confusion we may have caused Ms. Bowen or anyone else with our blog post for the Pure Michigan commercial. Nine9 looks to be as transparent as possible and will take ms. Bowen’s experience to better improve our processes. To avoid a similar scenario?